Step two: How do I go about to reach my goal? Starting on this step gives a boost of energy and motivation to move forward if it doesn’t then I would consider this to be an indicator that the goal is not that important and revise the first part. I am eager to get this going, can’t wait to get started. 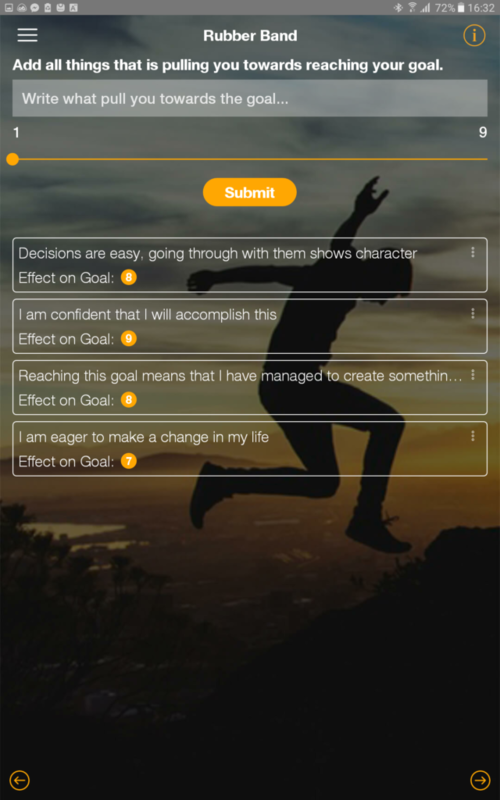 Moving towards new goals involves new challenges as well as going outside the comfort zone, and this is where it starts and maybe a goal setting app is our first step. The goal I have defined to accomplish will require changes in my life and of course the way I live my life. When I look at the goal I clearly understand that there are things which are considered to be obstacles and can hold me back, but on the other hand, there are many things that drag me towards this goal I have defined. In the beginning, it was difficult to write down the things I knew in my head, but when I got the process running they evolved into sentences that made sense. 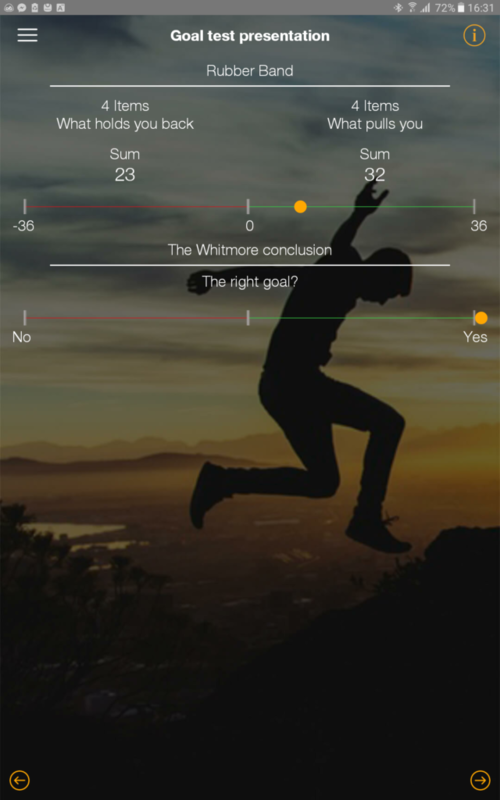 The Whitmore test we use is the complete test, many tests you can do only by using the first part (Specific, Measurable, Attainable, Realistic, time-phased – SMART). We found that it is useful to consider the full model to get a better picture of how good your goal is? Both the rubber band and Whitmore tests are voluntary and can be skipped with no effect for further work if you don’t find them useful. 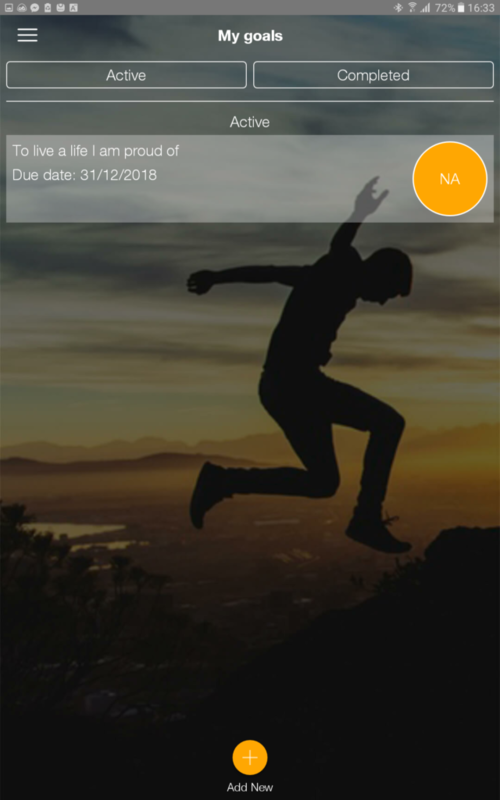 The self-assessment is meant to be dynamic and used throughout the journey to the goal and thus I did not spend too much time on this at this stage, it will become much more important later when I proceed in my journey. 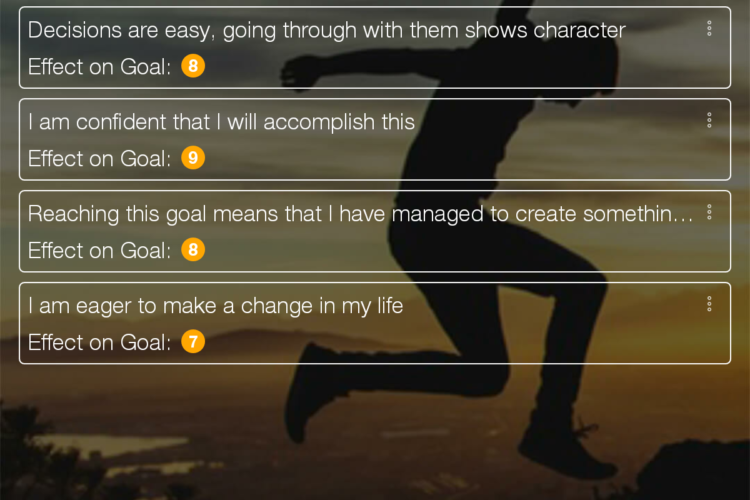 I have reached my goal overview and by clicking on my goal I get to the dashboard for this goal, the goal overview is an important navigation screen for those who define several goals. Now that I have reached the dashboard the real work begins: how do I get to my goal? There is, of course, more than one way to proceed with and you should do what comes naturally to you. The previous steps have defined a clear goal and thus made it possible to start defining specific tasks to initiate the process of achieving the goal. Another approach is to look at the things which the new goal involves through your understanding of what the new goal implicates – Describe what it looks like when the goal is reached? There are many thoughts on what is the best and most effective procedure to move forward from the dashboard point, my belief is that the best way is the way that works for you. Ultimately you will end up with specific tasks you must commence on the path that leads to your goal. You can compare this to a road trip: You know where you want to go and you know where you are. To find the path on the map that gets you from where you are to where you want to be can either start from your current point towards your goal or you can start from your goal and move backward. Both strategies will provide you with a path of the journey, which is the same thing you would want to get out of this procedure. For my process, I decided to define what this goal means to the way I should live my life when I live a life I am proud of, then look at my current state in the same areas to initiate immediate tasks in every area. This became an interesting exercise where I imagined what my life should look like, working days or any other day. 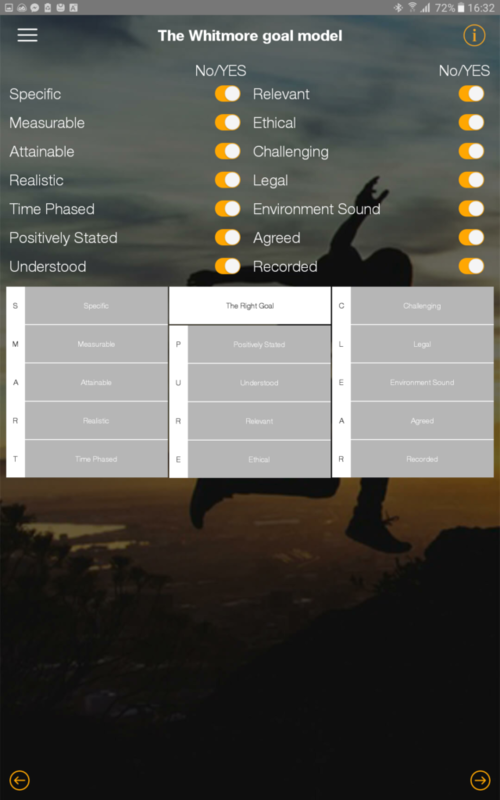 Then I broke everything down into the six areas defined in the NoLimit app and identified relevant milestones that reflect the situation. These milestones are set to check in the latter part of December 2018, and when I can tick them off I know that I have accomplished my goal: To live a life I am proud of.